It’s happened again – a laser pen halts a commercial flight and the media and pilots’ groups are in uproar. And rightly so. But a call for laser pointers to be classified as offensive weapons is not the answer. I have been studying lasers for over 30 years. In that time I’ve seen them transform from a scientific instrument to a commercialised product available for the public to buy worldwide. In recent years we’ve seen lasers become stronger and more affordable in spite of increasing legislation aimed at restricting their purchase or importation. Many of the gadgets advertised as within the legal 1 milliWatt limit, quite simply, are not. A study in Australia – a country with the world’s tightest restrictions on laser pen importation and possession – found 95% of a 41-pen sample bought online were illegal under national law. It is ridiculously easy to purchase dangerously strong lasers, intentionally or not, over the internet. And, increasingly, these lasers are being used for foul means. I was recently commissioned by the Home Office and Police Service of Northern Ireland (PSNI) to help combat an increase of laser attacks on riot officers. 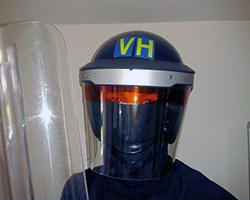 We developed a simple film that fixes to the top of police visors, protecting officers from the effects of lasers, whilst allowing full usability of the helmet. The protective eye strip can be easily and quickly deployed by dropping the sight line of the visor when required. The strip has been implemented across the full stock of PSNI riot helmets and results are staggering. Laser attacks during riots have significantly reduced as they no longer have the desired impact on police officers. I believe we could also achieve the same results in the aviation industry. In 2014, 1440 “laser incidents” were reported to the Civil Aviation Authority in the UK. A further 414 were reported between January and June 2015. It’s a growing problem. UK legislation now means perpetrators can be jailed for shining a light at an aircraft in flight, but what if we can prevent the problem from occurring in the first place? By adapting our defensive film to fit a pair of over-glasses we can protect pilots during take-off and landing, when they’re at their most vulnerable. Pilots can easily deploy the protective strip if threatened by a laser. If lasers no longer pose a threat to pilots, there is no story to tell; there is no notoriety to be had from targeting a plane, and this particular problem goes away. We need to find a solution to the effects of laser crime – not further compound the problem. 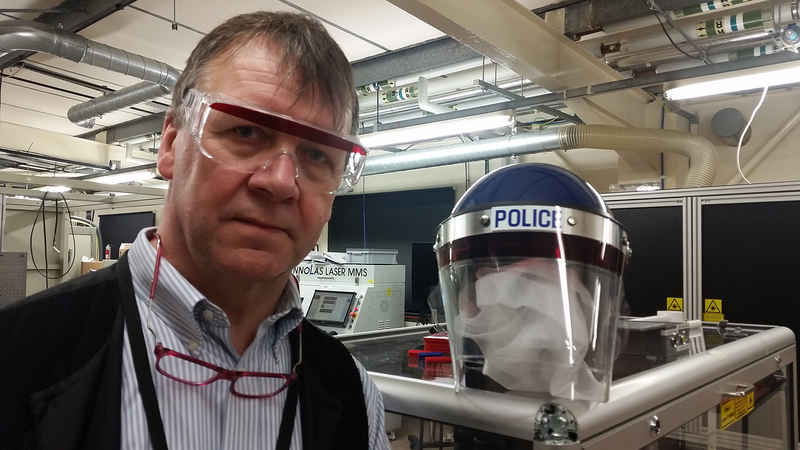 A protective eye strip has been developed at Loughborough University to protect police from laser attacks. They say it has significantly reduced the use of lasers during riots in Northern Ireland where it is used. Experts hope the the visor strip could also achieve the same results in the aviation industry, where laser crime is on the increase. In the first 6 months of last year, there were 32 attacks at Birmingham airport. Jon Tyrer is a Professor of Optical Instrumentation at Loughborough University. His company Laser Optical Engineering Ltd was established to commercialise his academic research.